* Google Instant will greatly increase ad impressions: Impressions will go up, because of the new “3 seconds counts as an impression” rule as well as the rule that any page engagement also counts. But, from an advertiser perspective, that “20 times as many searches” statistic tossed around today is going to be more conservative. * Increased impressions means increased costs: Most Adwords campaigns are cost per click, advertisers are not paying for impressions. * Advertisers will need to buy more keywords: Because Adwords are sold on the whole predictive text not partial queries, an advertiser still will be buying the same keywords, there’s no need to buy more keywords in order to to optimize performance. 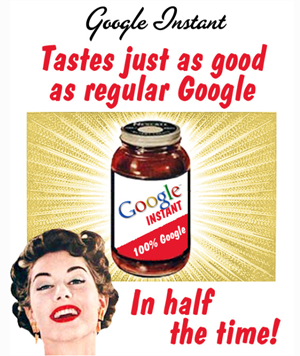 Google is banking on Google Instant users “learning how to search better,” or getting closer to the thing they were searching for, in essence optimizing the ad. “When the advertiser gets a click and they’re still paying the same amount for that click, they’re actually much more likely to get a sale from that,” says Vallaeys. The behavioral theory here is that normal non-instantly updating search is kind of hit or miss, and the more Google can serve up exactly what you want, the more you’ll actually want it or put your money where your mouth is and buy it. Not surprisingly, Vallaeys refused to speculate when asked for an estimate of how much revenue this improved Adwords campaign performance could mean to Google. My guess: A lot.